I'm so glad it's the weekend! I'm not sure why, but I've been feeling a little lethargic lately. I'm playing in a volleyball tournament today and I'm looking forward to playing around in the sand and getting my heart rate up under the warm sun (hopefully!). What are you up to this weekend? Below are some lovely, inspiring links I've gathered this week from around the web. A nice reminder about doing. Adding color to old, iconic images makes me see them in an entirely new light. Loving this melon-colored metallic belted coat from Calvin Klein's Fall 2012 NYFW runway show. I am LOVING the studded boots in this top picture. This blog makes me want to slow down and cook, cook, cook. This internationally-inspired wedding in San Francisco is so beautiful. gorgeous picture, love these colors! For me, not much today, i mean it's sunday ahah! maybe I'm gonna watch a dvd..
Love that tiger picture. Cute post! Nice! Check my blog and follow me if you want! I love the photo of the tiger you've used! Thanks so much for stopping by my blog, I hope you visit again soon. 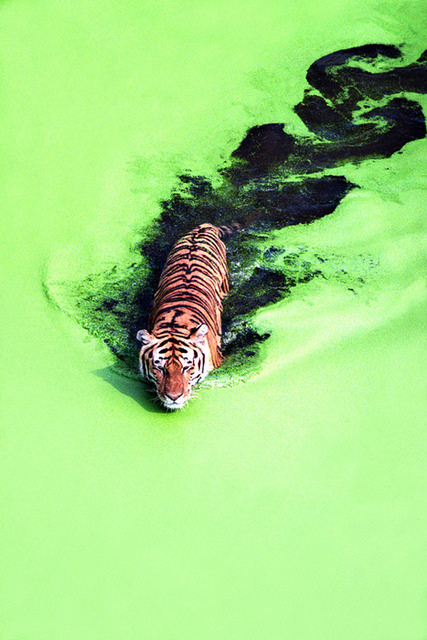 Great picture of the tiger! Thanks for stopping by! I'll be following to catch up on your latest wardrobe challenge! Amazing photo! I wish there is some way how to protect this beautiful animals! But reall protection!